Białystok -the capital of Podlasie and the area called Zielone Płuca Polski (literally translated as "the Green Lungs of Poland"), where you will be surprised by the city’s unique character, its excellent location, the hospitality and friendliness of its residents, its attractive historic buildings and sites, plus the unusual ambience of the city and the cultural diversity of north-eastern Poland. 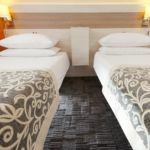 Hotel 3 Trio - a modern and comfortable hotel in Białystok, excellently located only 5 mins away from the city centre, in a quiet and peaceful part of the city. Recommended especially during business trips. It offers a comfortable and subtly decorated interior and excellent cuisine. It’s easy to get to quickly, avoiding the busy city centre. 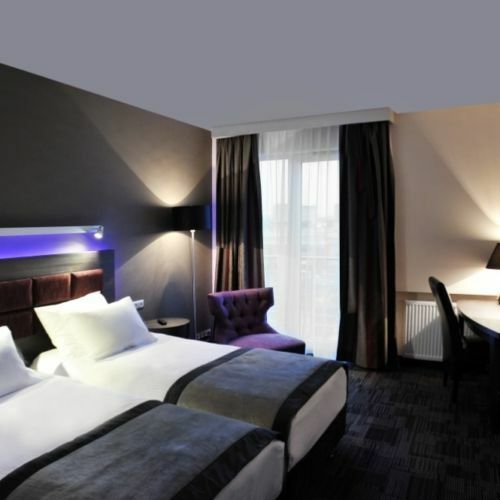 Hotel 3 Trio offers accommodation for a total of 115 guests in 70 single and double Standard, Superior and Executive rooms. For security reasons, all rooms are a non-smokig area. 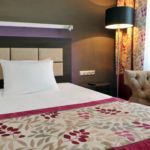 Each Single and double Comfort room has a bathroom with a shower, a 21’ LCD panel, satellite television, radio, phone and free-of-charge high-speed wireless Wi-Fi online access. Each Superior and Executive room, made available to guests in 2010, are designed to suit the needs of very demanding customers and features an elegantly modern decor. All these rooms are air-conditioned. Each has a laptop safe, a minibar, a 32 ’ LCD panel, and free-of-charge high-speed broadband online access.